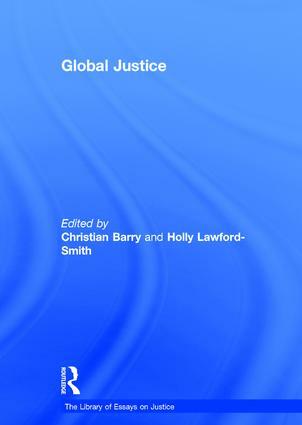 Contents: Introduction; Part I Standards of Global Justice: Assistance-Based Responsibilities to the Global Poor: Famine, affluence and morality, Peter Singer; We don't owe them a thing! A tough-minded but soft-hearted view of aid to the faraway needy, Jan Narveson; Does distance matter morally to the duty to rescue? Frances Myrna Kamm; Contribution-Based Responsibilities to the Global Poor: 'Assisting' the global poor, Thomas W. Pogge; Should we stop thinking about poverty in terms of helping the poor?, Alan Patten; Poverty and the moral significance of contribution, Gerhard Ã˜verland; Cosmopolitans, Global Egalitarians, and Its Critics: The one and many faces of cosmopolitanism, Catherine Lu; Cosmopolitan justice and equalizing opportunities, Simon Caney; The problem of global justice, Thomas Nagel; Against global egalitarianism, David Miller; Egalitarian challenges to global egalitarianism: a critique, Christian Barry and Laura Valentini. Part II Pressing Global Socioeconomic Issues: Governing the Flow of People: Immigration and freedom of association, Christopher Heath Wellman; Democratic theory and border coercion: no right to unilaterally control your own borders, Arash Abizadeh; Justice in migration: a closed borders utopia?, Lea Yp; Climate Change: Global environment and international inequality, Henry Shue; Valuing policies in response to climate change: some ethical issues, John Broome; Saved by disaster? Abrupt climate change, political inertia, and the possibility of an intergenerational arms race, Stephen M. Gardiner; Polycentric systems for coping with collective action and global environmental change, Elinor Ostrom; International Trade: Responsibility and global labor justice, Iris Marion Young; Property rights and the resource curse, Leif Wenar; Fairness in trade I: obligations from trading and the pauper-labor argument, Mathias Risse; Name index.